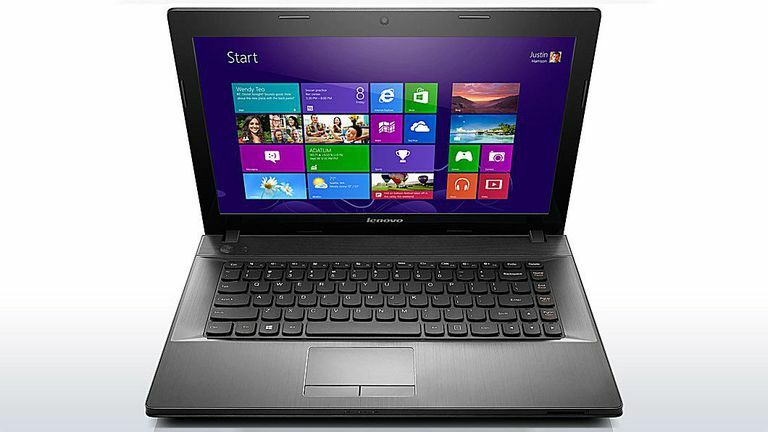 Lenovo's budget friendly G series laptops have been discontinued by the company. Instead, they offer the IdeaPad 300 series laptops although they only feature 15-inch and larger displays. For other current options for laptops under $500, be sure to check out our Best Budget Laptop picks. May 14 2014 - Those looking for a full laptop features with some performance will be happy that Lenovo still produces the G410. This value laptop may be relatively thick but the 14-inch screen helps keep the size a bit more manageable for those that need to carry it with them. While it has some strong performance, the battery life is also a bit better than the rest and it is nice to see two USB 3.0 ports while many companies still only provide one. Of course, it features Lenovo's excellent keyboard but those wanting a numeric keypad will have to opt for the larger G510 as it is not included on the G410. 14.9" x 9.3" x 1.31"
May 14 2014 - The Lenovo G410 is a system that will be reaching the end of its life in several months when Lenovo replaces it with a newer G series laptops. While it may be getting a redesign, the system is not really using old technology, it just is probably a bit bigger than many people want these days as it is 1.3-inches thick while many competing systems are slimming down to near one inch. The weight is still lighter than most of the 15-inch laptops out there though at 4.9 pounds. Exterior construction is still made of plastics but it does feature a good texture that helps deal with fingerprints and smudges. In a really interesting move, Lenovo is using the higher voltage Core i3-4000M dual core mobile processor for the G410. This means that it is not as energy efficient as some others based on the i3-4010U model but it does mean that it offers higher performance. In fact, this is one of the fastest laptops that can be found for under $500. The downside here is that it is still not a powerful system you want to use for things like heavy graphics or desktop video work. It can do it, just not as fast as slightly more expensive systems. The processor is matched up with 4GB of DDR3 memory that works well enough with Windows 8 but it still can get slowed down when heavily multitasking. The memory can be upgraded up to 8GB to help alleviate some of this problem. Storage features for the Lenovo G410 are pretty much what you are going to find in just about every low cost laptop these days. It uses a 500GB hard drive that offers a decent amount of space and spins at a 5400rpm rate. This means that it is not as fast as more expensive laptops that might use smaller capacity solid state drives or faster spinning 7200rpm hard drives. If you do need to add more space, there are two USB 3.0 ports of the left hand side of the laptop for use with high speed external drives which is more than the system laptop at this price range. There is still a dual-layer DVD burner for playback and recording of CD or DVD media. Now the G410 gets its name from the 14-inch display that it uses rather than a 15-inch panel. This does mean that it is a bit more compact but it doesn't suffer any lower resolution or quality as it still features a 1366x768 native resolution which is still less than many tablets but typical for a budget laptop. It offers a decent level of color and contrast but brightness can be an issue at times especially if you are using it outdoors. The graphics are handled by the Intel HD Graphics 4600 which offers a bit more performance than the HD Graphics 4400 found on the lower voltage processors. This is still not designed for 3D gaming at all as it really only has enough performance for PC gaming at the lowest resolutions and detail levels of mostly older games. It does provide some good performance boost if you happen to be encoding media with Intel Quick Sync compatible applications. The keyboard for the Lenovo G410 uses the excellent isolated design the company has been using for years. It features slightly concave keys that provide it with excellent comfort and accuracy. The big downside here is the G410 does not feature a numeric keypad which you have to step up to the G510 to get. This layout also means that some of the special function keys are on the right-hand side which may throw off some users trying to hit the backspace or enter keys. The trackpad is a bit smaller than the larger 15-inch laptops but it is still decent. Accuracy is good even with multitouch gestures. It features dedicated rather than integrated buttons. With its larger size, the Lenovo G410 uses your traditional 48Whr capacity battery pack which is becoming less common. Lenovo claims that this can allow the system to last up to five hours which seems to be a bit of a stretch. In digital video playback tests, the laptop was able to run for four and a quarter hours before going into standby mode. This puts it slightly ahead of the average for this price range of systems but it is helped by the larger battery pack and the energy efficiency of the newer Haswell based Intel processors. Lenovo claims that the list price for the G410 as equipped would be $699 but you almost never will see it priced that high. With all of the offers that Lenovo does, you will generally find it to be around $500. In terms of fully equipped laptop, this is very good pricing. Of course, the next Lenovo G series laptops should arrive around mid-summer so this is likely helping pricing of the G410. In terms of competition, the Dell Inspiron 15 and HP 15 are the closest competitors. The Dell uses a 15-inch touchscreen display for easier navigation of the Windows 8 operating system but it has less performance from a i3-4010U low voltage processor. The HP on the other hand uses a similar high voltage mobile processor but the older Core i3. Its primary advantage is that it comes with Windows 7 but it does suffer from less battery life and just a single USB 3.0 port.